Arjun Tendulkar, son of the legendary cricketer Sachin Tendulkar, impressed the Australian media with his performance in the ongoing Spirit of Cricket Global Challenge on Thursday. Playing for the Cricket Club of India, the 18-year scored a brilliant 27-ball-48 and then followed it up with a vicious spell of fast bowling where he picked up four wickets in as many overs at the Don Bradman Oval in Bowral. Arjun Tendulkar has provided a number of good performances in the last year and his match-winning contributions in the Cooch Behar Trophy kept him in the limelight. He picked up a fifer against Madhya Pradesh in November and later picked up a four-for against Assam. However, his most impressive spell came against Railways as he dismissed the first four batsmen to guide his team to victory. Arjun Tendulkar is more interested in his bowling and the left-arm pacer idolizes Australia pacer Mitchell Starc and England all-rounder Ben Stokes. Tendulkar Junior has even received bowling tips from Pakistan left-arm pacer and swing king Wasim Akram. Talking to ABC News after his match, Arjun was quick to point out that he is not bothered by the expectations that come with his lineage. “I don’t take that pressure, when I bowl I just hit the deck hard on every ball and when I bat (I) just play my shots and choose which bowlers to take on and which bowlers not to,” he said in the interview. THE Little Master’s offspring isn’t so little anymore. 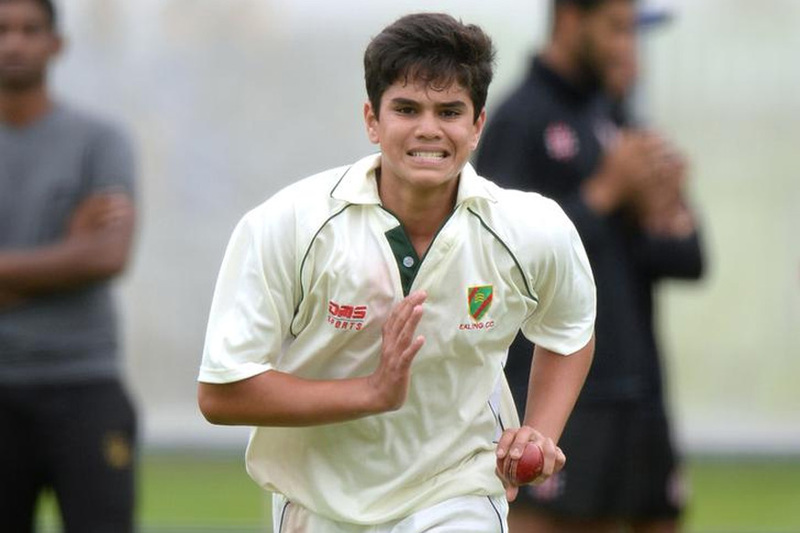 Arjun Tendulkar, the son of legendary Indian batsman Sachin Tendulkar, turned heads at Don Bradman’s home of Bowral, NSW, with a powerful performance for a Cricket Club of India XI on Thursday. After first visiting Australia as a cherub-faced toddler when India toured in 2003, Arjun is very much the strapping young man now and a far different build to his diminutive dad. He’s already six-foot and appears to be still growing — and has opted to make his name as a left-arm quick as he looks to follow in the most famous of footsteps. “I used to play taekwondo, cricket, football, swimming — and somehow cricket kicked in and everything else took a back seat,” the 18-year-old told the ABC. The opposition may not have been particularly strong, but Tendulkar showed his skill to take four wickets in four overs of the T20 match against Hong Kong as part of the SCG Cricket-run global challenge tournament. “I wasn’t out there for long enough to feel too much facing him but it’s good. It’s nice to see a young lad with a lot of expectation on him come out here,” Hong Kong batsman Mark Fuzes said. Tendulkar, who has played at under-19 level for Mumbai, followed that with a blistering knock of 48 runs from 27 balls. “I’m just so privileged to play on the ground named after Bradman, it’s unbelievable,” he said. In the same way Steve Waugh has sought to protect his talented son, Austin, from unreasonable expectations as he embarks on a cricket career that will continue at the under-19 World Cup next week, Sachin has shielded Arjun from the spotlight. “I am not interfering in his career because I think it is not fair,” Sachin told the Economic Times in 2016. “He has to have freedom to express himself. I can guide him. Not on a regular basis, but when I feel that he needs to be told something, then I do. I don’t take his class every evening when he comes back home. I do not want to lecture, but let him enjoy the game and fall in love with cricket, which he is (doing). I have told him things about hard work like any father would. “(Dad says) just play fearlessly, play for your team, be a team man and give everything you’ve got,” he added. Tendulkar will bring his game to the Sydney Cricket Ground this Sunday, the ground where his father announced himself to the Aussie public with an unbeaten ton as an 18-year-old in 1992. BCCI could certainly do with left-arm pace bowlers, so he's chosen wisely. And in this field, he couldn't have asked for a better guy to get tips from, than Wasim Akram. I hope he goes on to not just play for BCCI (even Rohan Gavaskar did) but actually become a match-winning bowler. That he's also an attacking batsman is great - but I hope he doesn't give up his bowling to focus more on his batting. It's silly if people put pressure on him just cos of his dad. Let me just say I wish him all the very best - and look forward to seeing his name (and that of Samit Dravid) in a future BCCI squad. Would be great to see a Tendulkar and a Dravid in a BCCI team again. Sunil Joshi's son, Aryan, got 154 in the game that Samit Dravid got 150. Here are some Indian father-son combos to have played for India/BCCI. They forgot to mention Pankaj Roy / Pronob Roy. Yeah, the worst thing we can do is compare them to their dad's. He is 18 years old and is not part of India squad of u.19 world cup that too held in NZ - good conditions for pacers. If he was remotely good enough he would have been selected. is he actually looking good to progress to international level? Go to Live Games Forum to take part in "I hold a gun to your head" Games. Verity wrote: is he actually looking good to progress to international level? What level is he getting these good results? Always seems to be getting runs or wickets? Arjun Tendulkar injured Jonny Bairstow with a toe crushing Yorker.He was the net bowler for the England team.He is still 18, part of Mumbai under 19 team, he has got results whenever he has played.I won't go too much that he is not picked in.under 19 team, Indian media would have charged Sachin with nepotism then, trying to push his son into the team. And his hero is Starc and Stokes.Very unlike Sachin Tendulkar. I have seen video clips of Arjun bowling to Sachin.Sachin used to correct his mistakes admonishing him in English, Hindi and Marathi. Like you are bowling a bad line, mate. Too early . Bloke is 18. We will know in 2 to 3 years if he is good enough. He is being coached by Subroto Banerjee ex India player and coach of Umesh Yadav.He is in good hands. bolero wrote: Arjun Tendulkar injured Jonny Bairstow with a toe crushing Yorker.He was the net bowler for the England team.He is still 18, part of Mumbai under 19 team, he has got results whenever he has played.I won't go too much that he is not picked in.under 19 team, Indian media would have charged Sachin with nepotism then, trying to push his son into the team. This is something Arjun will face in his career just like Austin Waugh. If they are good enough they will be picked for the national team over time. Agree. Selection should anyway be on merit. I don't think he will quite have the problem the Amarnath brothers had though. There was a lot of talk in the 70s (and hard to entirely disbelieve) that they were discriminated against by the selectors because of their father, Lala Amarnath. Lala was a fine cricketer in his time (his stats don't reflect this) - but beyond this, he was a rebel. He was constantly having problems with the establishment, which was used to compliant cricketers. So much so, that he was sent back midway through the England tour of 1936. Although much-admired by the public, he might have rubbed some people the wrong way. In those days, selectors anyway had a free rein. Nothing close to the media probing that you have nowadays. Mohinder Amarnath made his debut at a young age in 1969 - and immediately made an impact. Yet, he was dropped - and got a chance again only in 1975-76, when India toured NZ and West Indies. That was the same tour for which his brother, Surinder Amarnath, was selected - and got a 100 on debut (Auckland). The same Test that Kirmani and Vengsarkar made their debut. So Mohinder had to sit out 6-7 years. Surinder himself got a raw deal, in my opinion. He was an attractive left-handed batsman (used to usually bat at No.3 if I remember right!). Was dropped after Karachi 1978 - a Test in which he got 30 & 14 (run out). Part of a clean-up that included Bedi and Prasanna as well. In just the previous Test, he'd got 60. There was a lot of Test cricket played in the next 2 home seasons (1978-79 and 1979-80) - but Surinder was not part of any of it. As it is, he got a debut chance late - and in 2-3 years, his Test career was over. He was not even 30 then. He continued to get runs in domestic cricket including a 235* in the Irani Trophy final - but to no avail. It's not as if India had a surfeit of left-handers. They had this one reasonable-quality player - and chose to ignore him. No wonder the rumours were rife then that the father's sins(?) were visiting the sons. I can't vouch for that but selection decisions in those days did raise eyebrows. I have watched Mohinder Amarnath play on.TV and heard of this.Mohinder also famously called the Indian selectors a bunch of jokers.He was a rebel much like his father legendary Lala.Heard of Surinder, never watched him play. And Bharath Reddy being picked ahead of Syed Kirmani for the 1981 tour of England. I remember Kapil saying in an interview that it was left to Vishwanath (Kirmani's Karnataka team-mate and close friend) to break the news to Kiri. Kiri kept asking Vishy "why, why?" - and Vishy, almost in tears, said "I don't know". That was selection in those days. No wonder Mohinder once called the selectors "a bunch of jokers". raja wrote: Sunil Joshi's son, Aryan, got 154 in the game that Samit Dravid got 150. Just realised they even forgot Vinoo Mankad - Ashok Mankad. Now that IS a famous & fairly accomplished father-son combo. Far more than Yograj-Yuvraj and Roger-Stuart Binny. 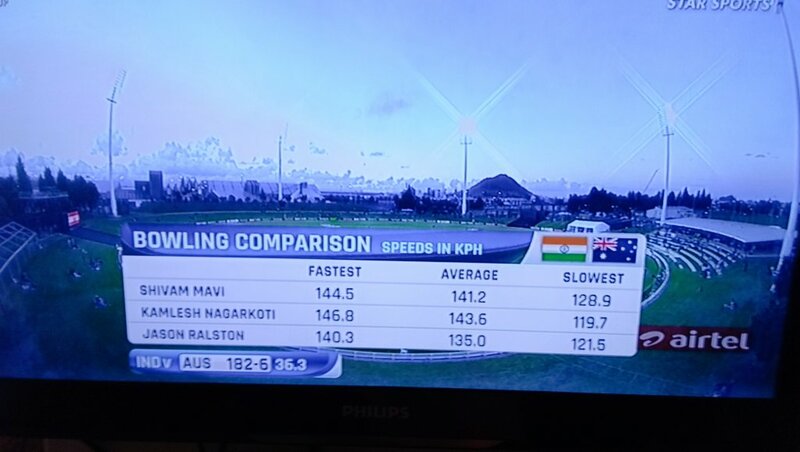 Some serious pace from Indian pacers. Arjun Tendulkar has been selected for the India under 19 team to tour Sri Lanka. bolero wrote: Arjun Tendulkar has been selected for the India under 19 team to tour Sri Lanka. What is his favourite food? He has been pretty low profile. The elder Tendulkar has kept him away from the spotlight, does not want him to become another Rohan Gavaskar. bolero wrote: He has been pretty low profile. The elder Tendulkar has kept him away from the spotlight, does not want him to become another Rohan Gavaskar. 12 nations play cricket at a high level, I don't recall a single cricketer pre-national U19 level besides Tendulkar Jnr having a thread titled to just who their heroes are. tell me about it. i deleted 3 such threads on this junior gully 2 cents cricketer that’s getting promoted just because of his last name. Like someone said, a father always wants his son to do what he himself couldn't do. 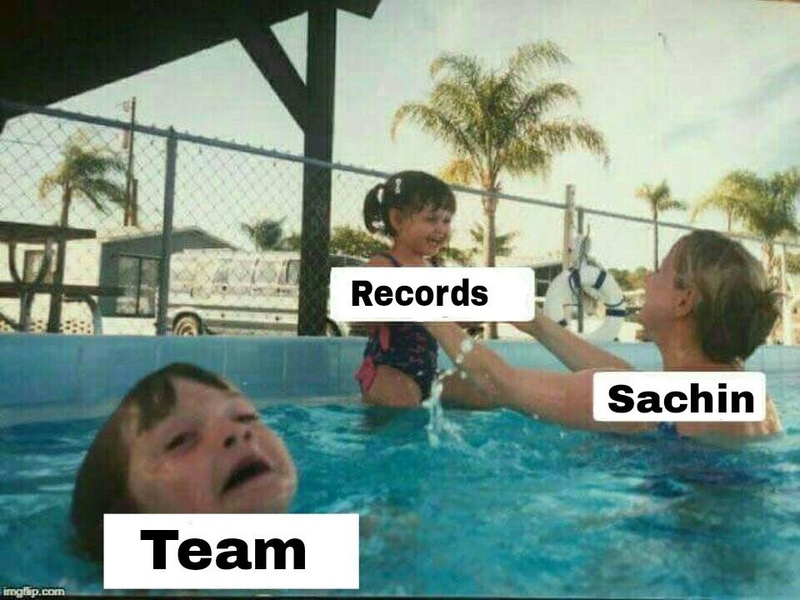 So Sachin must be really wishing Arjun wins Tests for BCCI.